In this experiment we will be on the hunt for the elusive Single Motor Unit. By detecting the activity of only one motor unit, we are getting a glimpse of the activity of a single neuron. That's right-you can use the Muscle SpikerBox to record the discharge of a single motor neuron in your body, if you are patient and creative enough to complete the hunt. Record Electricity from your Muscles - You should read this experiment first to learn about electromyography and motor units. Muscle Action Potentials - You should be familiar with using the small popsicle stick electrodes to record muscle action potentials. Based on experiments and writing by Colorado State University student Breonna E. Holland, Associate Professor Brian L. Tracy, and CSU's Muscles Alive! outreach program. In several other experiments, we talked about the motor unit - a single motor nerve cell, or motor neuron, and all of the muscle fibers that the neuron innervates. Saying it's a motor neuron tells us that it sends messages out from the spinal cord to control muscles. It isn't the kind of neuron (a sensory neuron) that sends messages to the spinal cord and helps us feel things. Motor neuron axons have special synapses with muscles called neuromuscular junctions that release the neurotransmitter acetylcholine onto muscle cells to activate them, causing muscle fiber action potentials. This is what we see in the electromyography (EMG) signal - the muscle fibers of a motor unit firing action potentials in response to the acetylcholine! In healthy physiology, a single action potential in a neuron always causes a single action potential in the accompanying muscle fibers. If we are able to recruit only one motor unit that is under our electrodes, this pattern allows us to see the single neuron's output on the muscle fibers using our Muscle SpikerBox amplifier. A single muscle contains many motor units (~100 - 5,000) thus, when you flex, many motor neurons are activated, causing many action potentials in the accompanying muscle fibers, which is why we hear the characteristic "whoosh" sound when we use the Muscle SpikerBox. Think about standing outside an arena when the home team scores - you hear a big roar, but you can't hear any one of the many individuals. How could we hear just one of those people? Sit in the seat next to them, right? In a human muscle, that would require a visit to a fancy neuroscience research lab, where we could stick a fine wire electrode directly into a muscle using a hypodermic needle, so that the tip of the fine wire is very close to the muscle fibers belonging to one motor neuron. This is NOT very practical for the do-it-yourself neuroscientist. Ouchy. But what if you got lucky when you entered the arena and there was one person shouting very loudly that you could hear from far away? 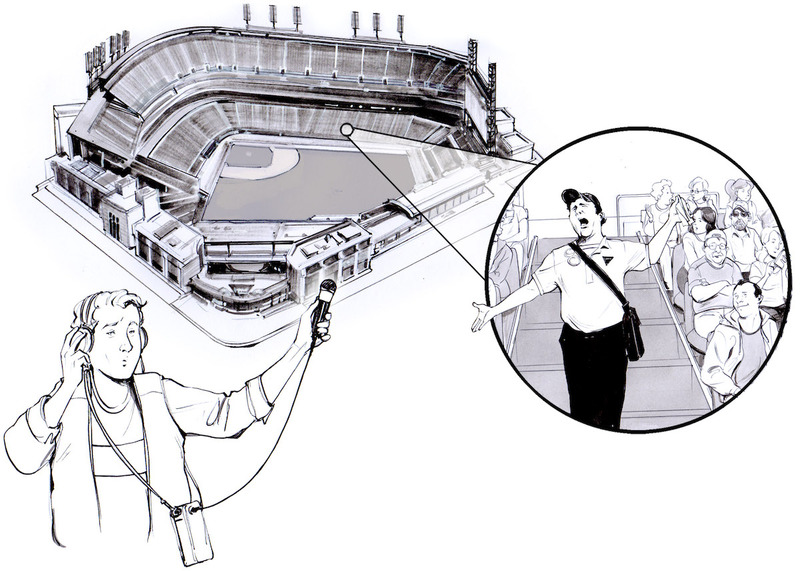 When the crowd is quiet, you may able to hear the individual person, but you would have to move around the stadium to eventually hear him - kind of like hunting for a single motor unit from above the skin. So here we are, on the hunt for single motor unit action potentials using our Muscle SpikerBox and popsicle-stick electrodes. Notice the repeated pattern of amplitude and spacing between the spikes. This regular pattern is how we can be sure it is a single motor unit. The quest is worth it! If you succeed, you are listening to the cellular discharge behavior of a single motor nerve cell from your own central nervous system. In this experiment, we are going to try to isolate individual motor units of the interossei muscles of the hand and the temporalis muscle of the jaw. Set up your Muscle SpikerBox Pro using a smartphone or computer with the Spike Recorder app. Make sure the red leads are attached to the metal tabs on the popsicle sticks and the black ground is around the screw you will gripping with your hand. Add conductive gel to the metal tabs attached to the red alligator clips. Connect the USB cable from the the Muscle SpikerBox Pro to the computer. Open Spike Recorder, and turn on your Muscle SpikerBox Pro. A USB icon should appear on the main SpikeRecorder screen. Click on it to connect to your Muscle SpikerBox Pro. (Note: If you are using a tablet, smartphone, and/or a Regular Muscle SpikerBox, you can connect to your tablet/smartphone/computer with the green smartphone audio cable. 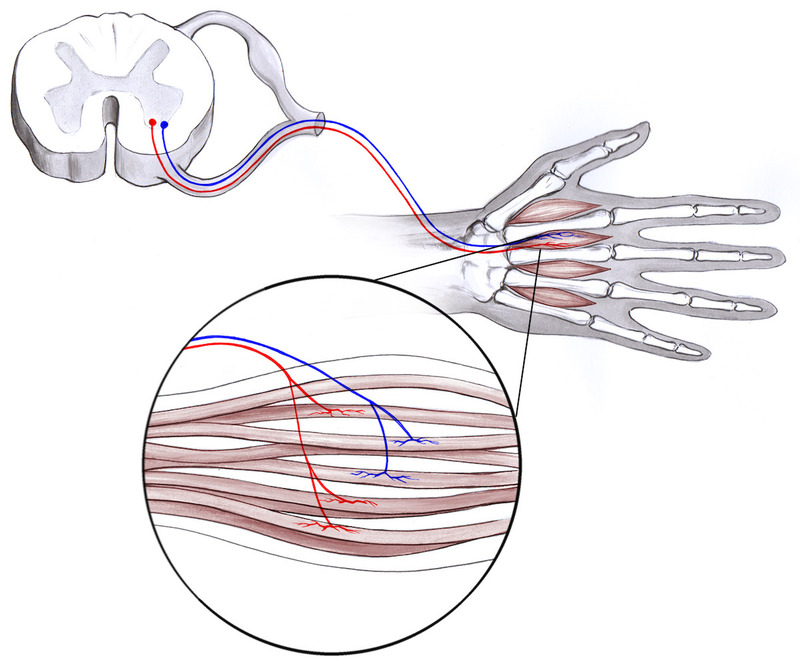 Place the electrodes over the back of your hand between the knuckles as shown in our Muscle Action Potentials experiment. Have your friend place a pen or pencil(eraser side down) adjacent to your middle finger. Have your friend veeeeeeeeerrrrrryyyyyy gently try move your finger with the pencil with a minimum of force. Now resist the pressure of the pencil oh so gently. You should begin hearing the distinct "pop" sound of an individual motor neuron causing its accompanying muscle fibers to discharge. This is a challenging experiment in self-control! To ensure the best possible conditions, try to do this experiment in a room that is relatively quiet in both ambient sound and ambient electrical noise. You can also try hooking up a secondary "louder" battery-powered speaker using the Backyard Brains blue audio cable that comes with your gear. This may help hear the faint individual popping of individual motor units. 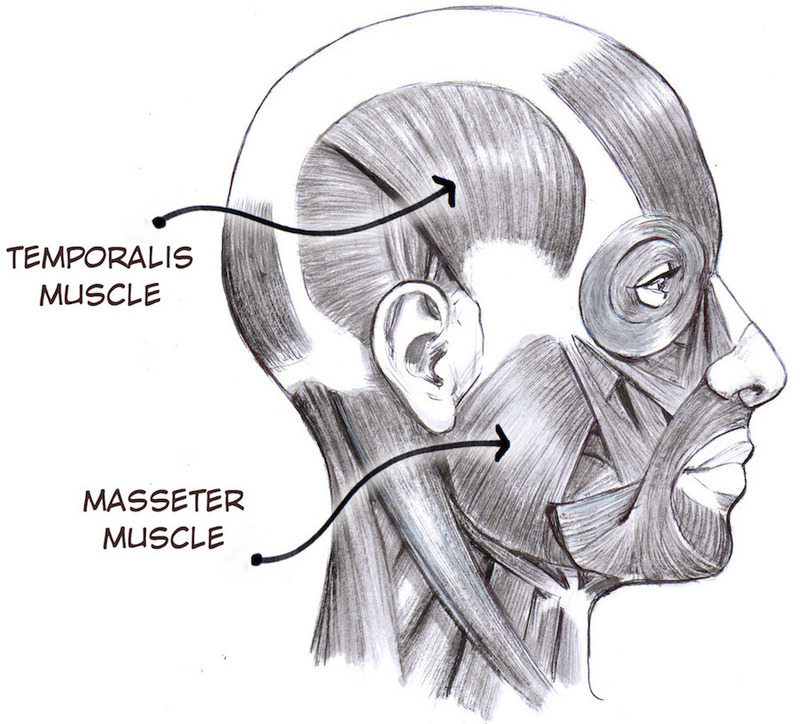 If you are finding trouble getting only one motor unit to fire in your hand, you can try another muscle, the temporalis of your jaw. Feel the side of your temple as you make chewing motions, this muscle (very visible on thin people when they chew gum) is your temporalis. Place your popsicle stick electrodes over this muscle. Close your jaw, bringing your upper and lower teeth together, but not applying force. Now, try to enter a type of "body awareness zen" and think about clenching your jaw muscles ever....so...slightly...barely even thinking of moving your muscles. 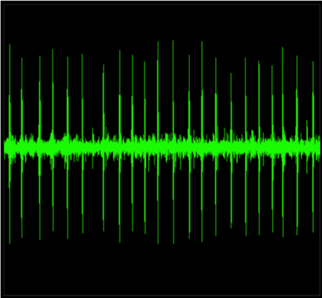 Listen and watch carefully for repeated spiking on the screen and regular popping in the audio. If you can't get good motor unit isolation on hand or temple muscles, try on other muscles you think may have good control over. 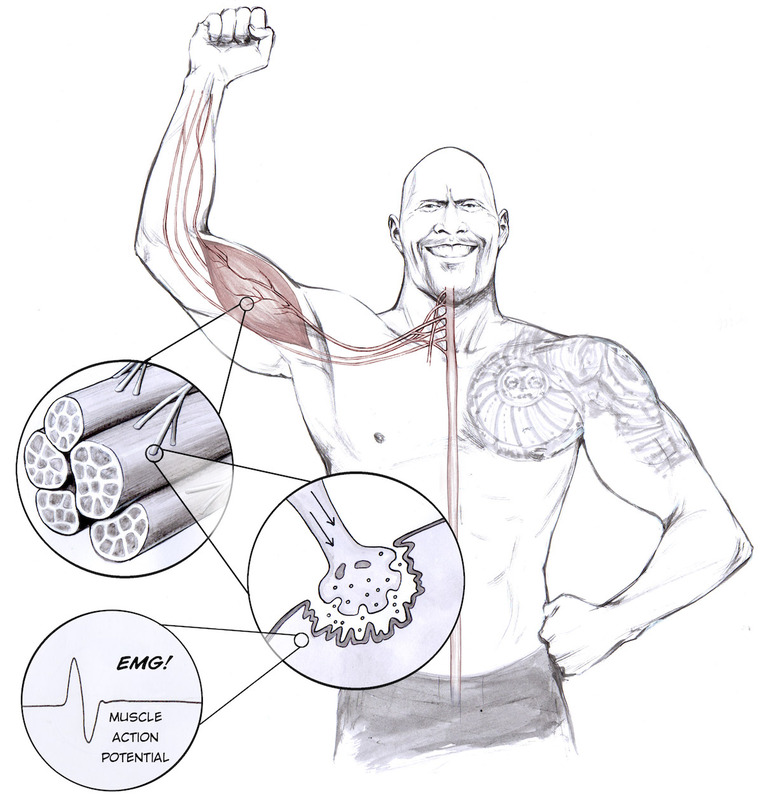 Try different locations on the same muscles, different muscles, different between-electrode distances. Get out your anatomy book or Google images and learn some new muscle anatomy. Make some recordings of good single motor units. Can you change the rate of firing with your thoughts? Can you measure the rate of firing (action potentials/sec) with careful use of the app? You can "SpikeSort" in the app to get a good measure of firing rate. You can easily often see 2-3 motor units, but can you isolate an individual motor unit? You can see in the video above it was challenging for us too! Happy Hunting! What does single muscle unit activity look like on different parts of your body? Are they different at all? Why or why not? Does muscle action potential amplitude ever change? Neurons often "spike" even when they don't seem to be actively transmitting signals, a phenomenon known as basal activity. Try recording from an "inactive" muscle (one you keep relaxed) for a while-does there seem to be basal spiking? Why do you think there is or isn't? Does basal activity presence or frequency change with different muscles? We have also basal activity of the hand interossei muscles is different in different people. Some people have zero basal activity, some have high firing even at rest! Maybe they recently had a cup of coffee? Investigate for yourself! Why do you think it's so difficult to find a single motor unit or single motor action potential? What does this say about human muscle anatomy and physiology? If you have our very first original Muscle SpikerBox with 3 separate leads (not a single orange cable), the colors of the alligator clips are different. The Red and Black clips should go around the metal tabs on the popsicle sticks, while the white clip goes around the screw you are gripping with your hand.